After typical Romanian stuffed cabbage rolls like these Vegan Sauerkraut with Rice, Walnuts and Raisins or these typical German Easy Stuffed Savoy Cabbage with Minced Meat, I am presenting you today with an Asian version of stuffed cabbage leaves: Asian Stuffed Napa Cabbage Leaves in Chicken Ginger Broth. It was the first time I have made something like this and although I have to admit that the recipe was rather elaborate, it needed quite a few ingredients and quite a bit of time, the result was sooooo worth it! I have rarely eaten such a bold, spicy and aromatic chicken broth and it was the first time I’ve mixed pork and shrimp together. I wasn’t so sure about that and I had even considered leaving out the shrimps, but then I remembered how many dozens of Asian recipes I have read where a mixture of meat and shrimp was used. And I thought that if so many people love that combination, than it cannot possibly be bad. And it wasn’t! It was so good! Soooo good! You could start one day in advance, if desired. Make the broth first and prepare the rest of the dish the next day. This way you will maybe escape that feeling of having spent too much time in the kitchen at one time. Making the broth couldn’t be easier and it will not take much of actual working time. Place the stock ingredients in a pot and simmer for about 2 hours. The only thing you have to do is to skim the froth from the broth when it forms, this way you will have a nice, clear broth in the end. You can use a whole chicken carcass to make the stock or the bones from several roasted chicken legs. 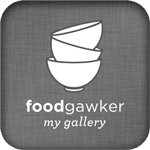 I always have some in my freezer, because I save all the bones when roasting a whole chicken or only chicken legs. I usually add a whole fresh chicken leg to the carcass for a meatier taste. However, if you do not have any roasted chicken bones, make the broth with 3 or 4 whole chicken legs or a small chicken. 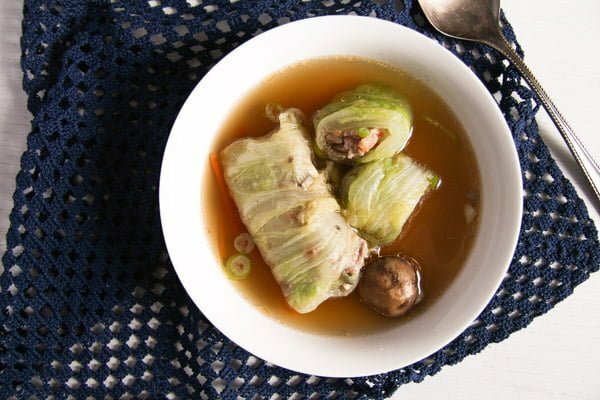 You can use this broth not only for these wonderful Asian Stuffed Napa Cabbage Leaves in Chicken Ginger Broth, but for other Asian soups as well. I had some leftovers and I used those to make a non-vegetarian version of this Soba Noodles Tofu Soup with Lime, Carrots and Kale. It was great! And not long ago, I have made this Asian chicken broth again without the stuffed cabbage rolls. I used some of the broth to make a soup similar to this Asparagus Chicken Noodle Soup with Leeks and Peas, but with an Asian touch and quite spicy and the rest for some regular Asian vegetable dishes. Perfect broth to have in the fridge! I can only recommend it! The method of preparing the Napa cabbage leaves for filling doesn’t differ very much from the method used for other cabbage leaves. But just like in the case of the Savoy cabbage leaves, Napa cabbage leaves do not need as much blanching time as the white cabbage leaves require. Two minutes should be enough. Make sure that you prepare a few more cabbage leaves than you think you might need, Napa cabbage is quite fragile when blanched and it can be that you will have to use more than one leaf for a roll in order to obtain a hole-free roll. I was able to make 10 rolls with this filling, however I needed almost double as many prepared leaves, because many of them tore while I was blanching them. Rolling the cabbage rolls is made in a similar way as mentioned in all the other posts in this Stuffed Leaves Series. Place some filling on the lower part of the leaf, fold the bottom edge over the filling, then fold the sides of the leaf over the filling and roll. The filling is also super easy and quick to make. Finely chop all the ingredients, mix them together and you’re done. 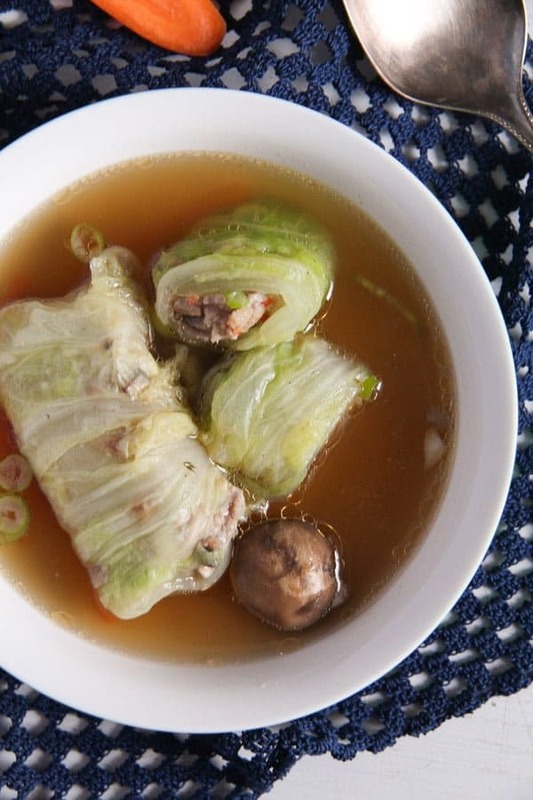 Serve these super healthy, gluten free, low-fat, low calorie Asian Stuffed Napa Cabbage Leaves in Chicken Ginger Broth sprinkled with coriander or parsley with the hot broth. Give the chicken carcass and the whole chicken leg to a pot. Add the quartered onions, crushed garlic cloves, chopped ginger, fish sauce, soy sauce and peppercorns to the pot. Add the water, bring to a boil and boil for 3 minutes. Skim off the foam, cover leaving a small crack open, turn the heat down to low and simmer the stock for 2 hours. Remove the lid and simmer for another 30 minutes to reduce the stock. Skim off any froth or fat from the surface of the stock. Strain the stock. Use the chicken meat for other dishes. Bring a large pot of water to a boil. Add some salt and blanch the cabbage leaves for 2 minutes or until pliable. Remove with a slotted spoon, refresh under cold water and drain well. Chop the mushrooms, the whites of the green onions and the Thai chili very finely. Give them to a bowl together with the minced pork. If necessary shell and devine the shrimps. Chop them very finely as well and give them to the bowl. Add the fish and the soy sauce. Mix well. 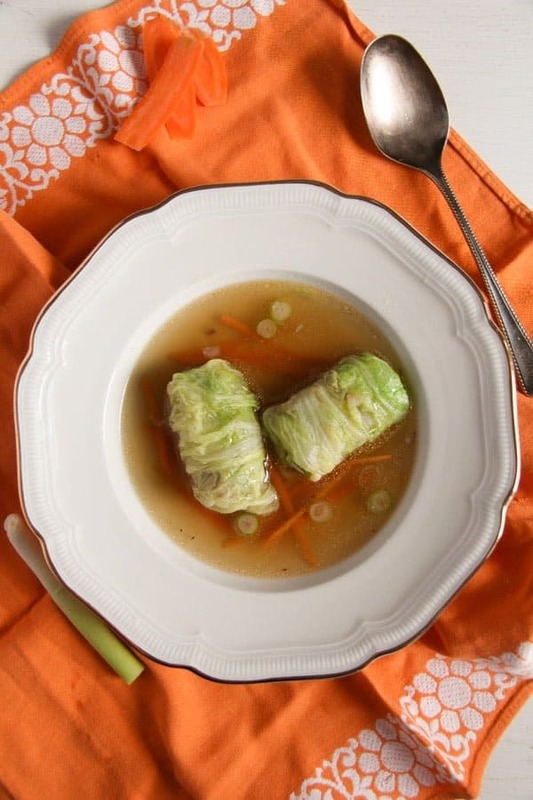 The recipe makes about 10 cabbage rolls. To make the rolls, place one cabbage leaf on the working surface. If the leaf is torn use two cabbage leaves to form the roll. Give a tenth of the filling about 1 cm/ ½ inch from the bottom of the leaf. Fold the bottom edge over the filling, fold in the left and right side and roll the leaf. Give about 1 liter/ 4 cups of the broth to a deeper pan. Chop the ginger roughly and give it to the pot as well. Bring the stock to a boil, turn the heat down to low and carefully place the cabbage rolls into the pot. Add the extra mushrooms and some julienned carrots, if desired. Let simmer for about 20 minutes or until the filling is cooked through. Sprinkle with the chopped spring onion greens, chopped parsley or coriander and serve immediately. You can use a whole chicken carcass to make the stock or the bones from several roasted chicken legs + one fresh chicken leg. I save all the bones when roasting a whole chicken or only chicken legs and freeze them for exactly this purpose of making stock. However, if you do not have any roasted chicken bones, make the broth with 3 or 4 whole chicken legs or a small chicken.I was able to make 10 rolls with this filling, however I needed almost double as many prepared leaves, because many of them tore while I was blanching them.I only needed 4 small mushrooms for the filling. I gave the rest of the mushrooms to the stock together with the cabbage rolls. They tasted great, but they are optional. Shrimp and pork combo is a wonderful thing. It makes for a delicious egg roll filling. I love these stuffed cabbage leaves! It screams comfort to me, and it sounds so flavorful with the homemade ginger stock. Pinning! Egg rolls filled with shrimp and pork sound delicious!